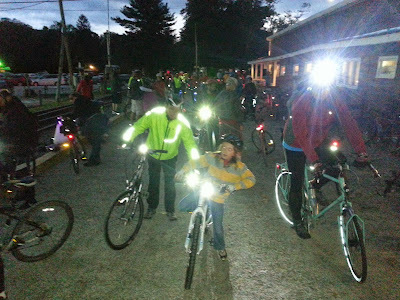 Century Cycles Blog: Thanks for coming to the latest Night Ride on the Towpath Trail! Thanks for coming to the latest Night Ride on the Towpath Trail! Thanks to everyone who came to our latest Night Ride on the Towpath Trail this past Friday! We had 106 riders for a cool but pleasant fall evening ride. Our LAST Night Ride for the 2014 season will be on Saturday, September 27, 2014. As always, the ride starts at 8:00pm sharp from the parking lot of the Century Cycles store in Peninsula. Arrive earlier to have plenty of time to find parking and get yourself and your bike ready! See www.centurycycles.com/for/NightRides for more details, including directions, preparation tips, and photos from past rides. Inaugural NEOCycle was a huge success! National Bike Challenge ends TOMORROW! Come to Home Depot's Safety Day in Brunswick! Congratulations to Kelly and Dennis! Bike Safety Awareness Yard Signs - Now Available!